Mining equipment and tailings are shown Thursday behind the Red Arrow Mine buildings in Mancos. 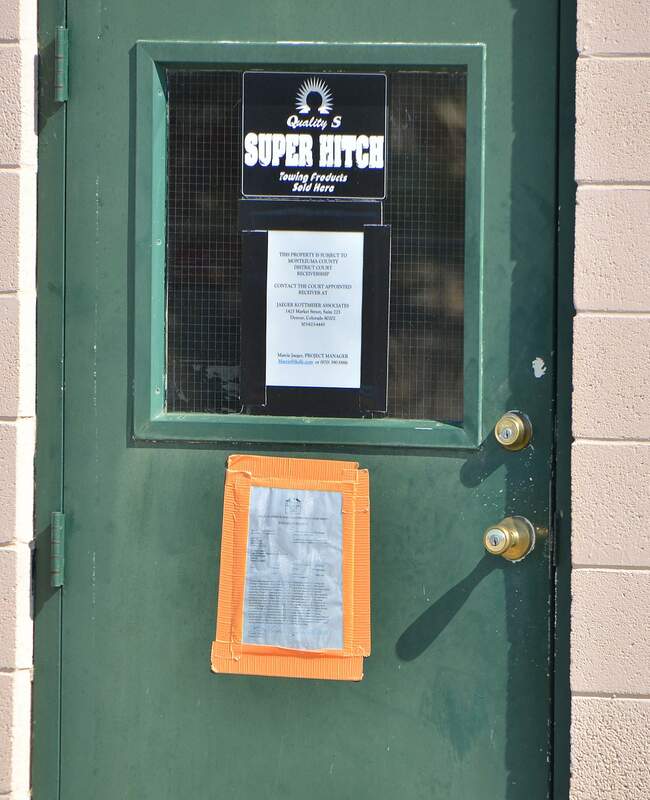 The door at the Red Arrow Mine building has a receivership sign from the county and a cease-and-desist order from the Colorado Division of Reclamation, Mining and Safety (the sign with orange duct tape). 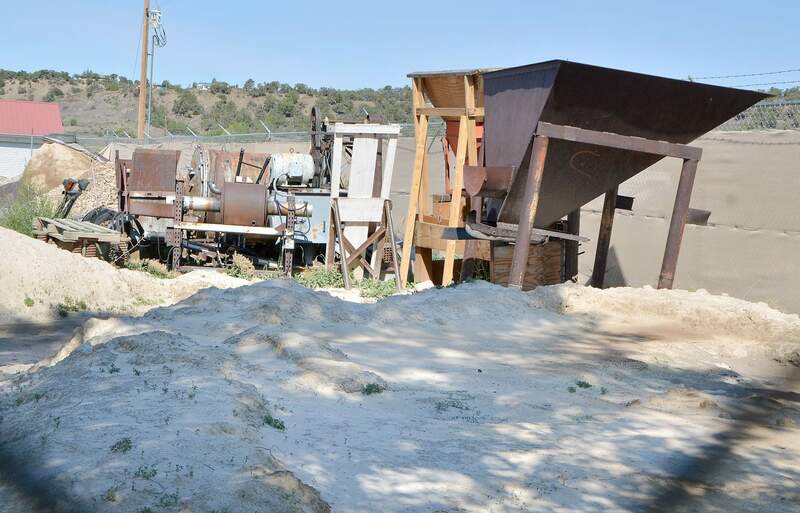 DENVER – Mining inspectors have found heavy pollution from mercury and arsenic inside an unpermitted gold mill on the west side of Mancos. It’s “one of the uglier cases of using hazardous chemicals and illegal milling” that state mining regulators have seen, said Julie Murphy, a lawyer for the state Division of Reclamation, Mining and Safety. The U.S. Environmental Protection Agency plans to inspect the area soon and decide whether it needs to begin a cleanup under the Comprehensive Environmental Response, Compensation and Liability Act, commonly known as the Superfund law, said Loretta Pineda, director of the state mining division. On Wednesday, the state Mined Land Reclamation Board slapped fines totaling $337,167 on the mill’s operator, Red Arrow Gold Corp. If Red Arrow cooperates with the cleanup and increases its bond with the state, $185,000 of the fine will be suspended. The facility has been shut down since April because of a bankruptcy dispute. The state got involved in June and issued a cease-and-desist order on the mill. The state contracted with Walter Environmental to test for contamination inside and outside the two buildings on the site, and the results came back last week. Inspectors painted an alarming picture of what they found at the two small buildings, which sit across Grand Avenue to the north of the Western Excelsior aspen mill. They showed pictures of a series of machines that use mercury to separate tiny gold particles from rock taken from Red Arrow’s mine about 10 miles northwest of Mancos. The mercury-gold mixture was heated to separate the gold and attempt to recycle the mercury through a scrubber. A galvanized steel washtub was flipped upside down and used as a hood to catch mercury near the scrubber. Tests on the most polluted piece of equipment found mercury concentrations of 32,000 parts per million. The acceptable standard for industrial operations is 43 parts per million, said Russ Means of the mining division’s Grand Junction office. Mercury also turned up in several other parts of the small building, including a stack of orange Home Depot buckets that were used to hold sludge from the operation. “It is safe to assume the whole building has some level of mercury and arsenic contamination requiring remediation,” Means said. Tests also found arsenic pollution at waste piles stored at the Western Excelsior mill and a nearby farm. The Mined Land Reclamation Board found Red Arrow in violation of six mining laws, including operating the mill without a permit. The president of Red Arrow, Craig Liukko, did not attend Wednesday’s hearing. Instead, he sent Richard Eaman, a metallurgist who has worked for Liukko. “I have looked at his operation and found it was a very good operation,” Eaman said. He disputed that Red Arrow had broken the law by operating an unpermitted mill. “It’s not a mill. It’s a pilot plant test facility,” Eaman said. But mining board rules don’t permit a mine operator to appear by proxy when he is facing a hearing for a violation, so lawyers for the state quickly cut Eaman off. Murphy, the Division of Reclamation, Mining and Safety lawyer, said she told Liukko’s lawyer 10 days earlier about the board’s rules that require a personal appearance. Eaman said Liukko couldn’t make the trip because his company’s assets have been frozen. Liukko said the same in an Aug. 2 letter to the mining division. Red Arrow was forced into receivership in April by a state court in Montezuma County after a major lender, Maximillian Investors LLC of Delaware, said the company was in default of its loan. The receiver, Jaeger Kottmeier Associates, was appointed to guard the company’s assets during the legal dispute. Liukko said he was in the process of cleaning up the mill to turn it over to the owner of the land where it sits. But the receiver showed up and forced him to turn over the property, even though the cleanup wasn’t finished. Liukko also blamed a joint-venture partner for muddling his business. In the letter, Liukko said he carefully studied the law and was under the impression that the mercury mill would not need a permit. He at first wanted to put the mill in a commercial building he owns in Mancos, but he didn’t want to displace his tenants. Means said Liukko’s business disputes were beside the point of Wednesday’s hearing. “The response itself shows a clear lack of understanding of the environmental and health impacts of using mercury,” Means said. Inspectors with the mining division admitted at Wednesday’s hearing that they lack the expertise to manage a cleanup of the harmful heavy metals. Kate Pickford, a Durango-based inspector, read a summary of the potential harms of mercury from the EPA’s website. Mercury is a neurotoxin that can cause tremors, mood swings and cognitive impairment. It is most harmful in poorly ventilated indoor spaces. But Means, the other state inspector, said he and his staff don’t know the extent of the pollution and whether it might be harmful to the people of Mancos. The highest mercury concentrations were found on a piece of equipment that was vented to the roof without scrubbers. “Prevailing winds could blow it over into the horse pasture, and a quarter-mile away, there’s a trailer park. We don’t know what the impacts of that are,” Means said.